"n February 1828, the Russian Empire annexed the historical Armenian province of Erivan (Yerevan) from Persia. The province included Mount Ararat, a symbol of Armenian national and spiritual identity, said to be the resting place of Noah’s Ark. The mountain had never before been scaled in recorded history. Explorer Friedrich Parrot of the University of Dorpat (now Tartu, Estonia) decided to take on the challenge of climbing Ararat. In 1829, he traveled to the Caucasus with an expeditionary team. Accompanied by Armenian writer Khachatur Abovian, he eventually reached the summit of the mountain. His memoir of the expedition, Journey to Ararat, was later published in German in 1834 and translated into English by William Desborough Cooley and printed in the United States in 1846. 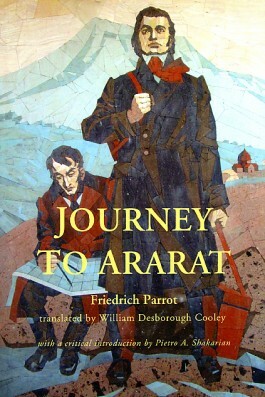 The content of Parrot’s account is not just limited to Armenia and Mount Ararat. It also contains plenty of fascinating insights on the broader region in the late 1820s. These include impressions of Georgia, Ingushetia, North Ossetia, Kalmykia, eastern Ukraine, central Russia, and the German colonies of Transcaucasia. This new edition of the Cooley translation includes a critical introduction by Pietro A. Shakarian, new maps, and historical documents from Estonia and Armenia related to Parrot’s expedition. It also includes illustrations from the original English translation of Parrot's book, reproduced with the assistance of the Cleveland Public Library’s John G. White Special Collection of Folklore, Orientalia and Chess and Digital Public Library. All of these new and restored elements provide a fresh look and understanding of Parrot’s 1829 expedition to the Holy Mountain. The text itself is an engaging and often informative travel memoir of 19th century Russian Armenia and Transcaucasia.